Written with John Lennon in Paul McCartney's front room in Liverpool, I Saw Her Standing There was the opening track on The Beatles' debut album Please Please Me. Sometimes we would just start a song from scratch, but one of us would nearly always have a germ of an idea, a title or a rough little thing they were thinking about and we'd do it. I Saw Her Standing There was my original, I'd started it and I had the first verse, which therefore gave me the tune, the tempo and the key. It gave you the subject matter, a lot of the information, and then you had to fill in... It was co-written, my idea, and we finished it that day. The lyrics were written in an exercise book from the Liverpool Institute. Mike McCartney's book Remember includes a photograph of Paul and John working on the song while reading the book and playing guitars. We were learning our skill. John would like some of my lines and not others. He liked most of what I did, but there would sometimes be a cringe line, such as, 'She was just seventeen, she'd never been a beauty queen.' John thought, 'Beauty queen? Ugh.' We were thinking of Butlins so we asked ourselves, what should it be? We came up with, 'You know what I mean.' Which was good, because you don't know what I mean. A slightly slower version of I Saw Her Standing There, believed to have been recorded during a rehearsal at the Cavern Club late in 1962, is available on bootleg recordings. The recording features no rhythm guitar by John Lennon; instead he played harmonica in the introduction and beneath McCartney's vocals during the verses. The recording features laughter from McCartney and Lennon as they sing "Well we danced all night/And I held her tight/And I held her hand in mine" during the second bridge. A live version of the song, recorded on 24 October 1963 in Stockholm during The Beatles' tour of Sweden, was released on Anthology 1 in 1995. Several other live bootleg versions exist, including two from the Star-Club, Hamburg. The Beatles recorded I Saw Her Standing There eleven times for BBC Radio. The first was a live broadcast for the Saturday Club programme on 16 March 1963, and the final recording took place on 1 May 1964 for From Us To You. A version recorded on 16 October 1963, for the radio show Easy Beat, was first broadcast on 20 October, and was released commercially in 1994 on Live At The BBC. 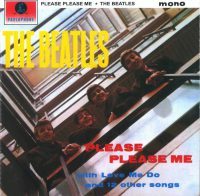 Although it was the lead song on the Please Please Me album in the UK, I Saw Her Standing There's first US release was as the b-side of the I Want To Hold Your Hand single, on 26 December 1963. I Saw Her Standing There was recorded during the marathon session on 11 February 1963, which yielded the majority of tracks on the Please Please Me LP. It was recorded under its working title, Seventeen. That's Paul doing his usual good job of producing what George Martin used to call a 'potboiler'. I helped with a couple of the lyrics. The group recorded nine takes in the morning, just three of which were complete. Take one was judged to be the best, and that afternoon The Beatles overdubbed handclaps. George Martin later edited in McCartney's spirited "One, two, three, FOUR" count-in from take nine. The full version of take nine can be heard on the Free As A Bird single, released in 1995. McCartney later revealed that I Saw Her Standing There's bass part was lifted from Chuck Berry's song I'm Talking About You, a single in February 1961. I played exactly the same notes as he did and it fitted our number perfectly. Even now, when I tell people about it, I find few of them believe me. Therefore I maintain that a bass riff doesn't have to be original. Maybe my favourite “Album one/Side One/ Track One” ever. This song rocks! John Lennon plays a wonderful and driving rhythm guitar that makes this song FANTASTIC! an early beatles song. nice lead part by george. Hands down, the best rock ‘n roll song ever recorded. You are true. TONS of rock songs since this masterpiece of amazing music have been modeled after this entire beat. As timeless as any Beatles song ever. Unfortunately this masterpiece suddenly doesn’t feel so original to me anymore, since I found out that all the key factors to this song are borrowed. The melody structure of ISHST is nearly identical to ‘When the Saints go Marching In’, the song in their repertoire during time in Hamburg. The overall feeling, tempo, and the driving rhythm guitar are very much the same in these two songs. Plus the base riff from Chuck Berry. What a pity! Still a great song, of course, from the number one band. “I saw her standing there” a most excellent song came out when I was only 2 years old.I didn’t discover The Beatles until they broke up in 1970 when I was 10 years old.But I heard their music when I was growing up.This song sounds like they captured that time frame of 1963 they were in when it was recorded.Its just that special unique Beatle sound that only they could do. I don’t think anybody’s debut album first track has ever jumped out the box like this one. You can hear all four parts of the music separately, and even after listening to so much of their work that followed this one, it still stands out as one of their great group performances. It’s one of John’s best rhythm jobs & Paul’s bass drives the entire track. But what jumps out the most is the counter melody in chorus & bridges, Paul going up with John supporting the effort behind him. Add in George’s great solo & Ringo’s intense effort during the solo & you have one of their best songs ever. Most Overrated Beatles Song Ever. An high energy, but ultimately boring, song. They should have given this away to another act. You obviouly underestimate the fact that this song broke through the crap of the day! This being the first song on their first album and Twist and Shout as the last song, made their debut album (On VEEJAY records) totally rock and forced people in the US to notice them. It is only a matter of taste. For me it is a classic as important as those hits by Little Richard and Carl Perkins’ Blue Suede Shoes. I wonder how old they were when they penned it. I know they completed in 62 but it seems they were still students when they had the idea. They were really born to rock and change the musical world. I remember reading that Paul was 16 years old. Sorry Sun King, I usually find myself agreeing with a lot of what you say – but we part company here. ISHST is an absolutely outstanding rock and roll song – in my opinion, of course. And when it first came out and hit the US airwaves in ’63, you can be sure NOBODY sounded like this. In particular, when the middle eight hits “Well me heart went boom” – people are still trying to write transitions like that almost 50 years later. It’s worth noting that John Lennon, during his solo years, only performed one very old Beatles song live – and this one was it. Didn’t John perform Come Together at the One To One Concert and Yer Blues at Varsity Stadium in Toronto? But do you know what bet, and who it was with that took place beforehand that made him agree if he lost the bet he would perform it with this person? This was also the night of Lennon’s reconciliation w Yoko and she was there as well (at the invite of EJ?) And I do not recall the date of the concert but Sean was born within the year of this show. November 28, 1974. Thanksgiving at Madison Square Garden. It’s available on the Here and There CD (not the original vinyl) which was released in the 1990s. This was also Lennon’s last concert performance, six years before he died. The CD edits out the seven- or eight-minute standing ovation Lennon got when he came out. There aren’t too many real driving rock n roll numbers penned after the golden age of the fifties, but this one is a true classic and stands up with the best of Berry and Richard. One of George’s best solos too. yes robert, you are absolutely right; he played it at a concert with Elton John (I think in Madison Square Garden) and he introduced the song as follows: “i would like to do a song now that was written by an old fiancé of mine). You might clarify do say 1 McCartney-written Beatles song in his solo career. Absolutely agree with Pablo. I’ve never understood why Love Me Do was chosen as their first single, ISHST is so strong. I guess in the end it didn’t exactly hurt them! If you believe that ISHST was completed in Sep 62, Love Me Do was already recorded at that point (June 62) and decisions to put out something different were probably not easy to make that late in the game. Love Me Do was released on October 5 – they were likely already printing up discs and sleeves at that point. Making a change that late for an unknown group wouldn’t have played well, I’d think. Probably the BEST rock and roll song ever written. It has everything: Boy meets girl, They fall in love, they dance…and it really rocks. Basic. Timeless. Happy. The perfect dance song. This is a great rock song. And the live versions do give some sense of how exciting early Beatles live shows would have been. I have to admit though that I’ve never listened to it quite the same way since it was pointed out how closely the harmonic structure follows When the Saints Go Marching In. It’s interesting that John sang the highest part of this song (“in miiiiiiine”) with Paul momentarily switching from melody to a lower harmony. Not sure why they did it that way given it would have been easier for Paul to reach those notes, specially as John had a sore throat when the “Please, Please Me” album was recorded. Confession: when ‘I want to hold your hand’ was released, I was NOT impressed. But when the flip side, ISHST started getting regular airplay, I was majorly hooked on the Beatles. I met my wife at a dance in high school. We were just 17, she stood in front of me and held out her hand. I haven’t danced with another since. This is one of our songs. So timeless, she was born the month after the song was recorded. one two three FWAH! And history is made. Absolutely. George Martin’s decision to patch in the 1-2-3-4 count-in from a different take was a master stroke. It grabs your attention and says that what you’re about to hear is something new and exciting (by 1963 standards anyway). Too bad no one told Vee Jay. I love this song! One question though…I noticed in the live versions of ISHST, they go from the guitar solo back to the third verse, while on the recorded version, they go from the solo to the middle eight (“My heart went boom…”) which sounds much better. Any clues from any of the books as to why the recorded version is different? Maybe George Martin wanted the song to last a bit longer and asked them to do the middle eight twice?. It’s such a great live track, but I always miss the 2nd middle eight after the solo, gives the song a real burst of energy after George’s rockin’ solo. Bill- I agree the second middle eight version is better. From what I’ve read (I can not remember sources.) the reason they left out the second eight was for the purpose of shortening the song. In those early days pop/rock bands had about 30 minutes max to perform. Acts had to get on and off so the others on the bill could play without the show running very late. With this in mind songs were shortened where possible. It also allowed bands to play more songs with the hope of increasing record sales. Radio stations use to use shortened versions all the time. Depending on the format of a particular station some still do. The Doors ‘Light My Fire’ comes to mind. Back in the day the solo was chopped to the intro and outro. It sounds quite rude. Once I love a song to hear an edited version destroys the flow of the performance for me. Great choice as an opening track to your first album by The Beatles. A McCartney song with great input by Lennon. Paul McCartney’s vocals are brilliant and others have said a wonderful lead guitar solo by George Harrison.”Please Please Me” is a great debut album, to open with this and close with” Twist and Shout”, breathtaking!! Does anyone know of a bootleg of this song. (I saw her standing there). I remember listing to Breakfast with The Beatles on 97.1 radio station with host; Deirdre O’Donoghue. Once in a while she would play good gems. And she would always say, “get your tape recorders ready.” She played, I saw here standing there but this one in practiculer was George’s Lead solo. All I remember that it was awful. And you can here John and Paul laughing hysterically. I’m very sure it was during the recording sessions. I have many bootlegs and all 9 takes of ” I saw her standing there”. But this one in practiculer I can’t find. Does anyone know about this one? Or I’m I wrong on the song? And by the way, I did get my tape recorder ready but my dumb sister eventually got this one tape and recorded over it. I just want to say that as great as this song is, the mixer/producer can ruin the song or send it to another level. I refer to the count in edited onto the beginning of the song and the ringing of George’s guitar in the early part of the recording, especially the one chord fill in the second verse after “I’d fall in love with her.” It always sends a chill up my spine when I hear it. One of my top five Beatles songs, if one can narrow down a top five. Lightning in a bottle. What a powerful way to start a record -and with a brilliant count in. There was nothing like it, and they were off. I generally prefer their later lp’s and songs to their earlier ones, but rank this song right up there with any of my all time favorites. They still play this song at live sporting events and I never tire hearing it then. Gabriel – Is it possible that you are mis-remembering hearing Take 1 of A Hard Day’s Night?